In its thirtieth flight, conducted from Satish Dhawan Space Centre (SDSC) SHAR, Sriharikota today night (July 10, 2015), ISRO's Polar Satellite Launch Vehicle PSLV-C28 successfully launched three identical DMC3 commercial Earth Observation Satellites, along with two smaller satellites from United Kingdom, into a polar Sun Synchronous Orbit which was very close to the intended orbit of 647 km height. The five satellites together weighed about 1440 kg at lift-off. These five satellites were launched as part of the agreement entered into between DMC International Imaging (DMCii), a wholly owned subsidiary of Surrey Satellite Technology Limited (SSTL), UK and Antrix Corporation Limited, the commercial arm of the Indian Space Research Organisation (ISRO), a government of India Company under the Department of Space (DOS). 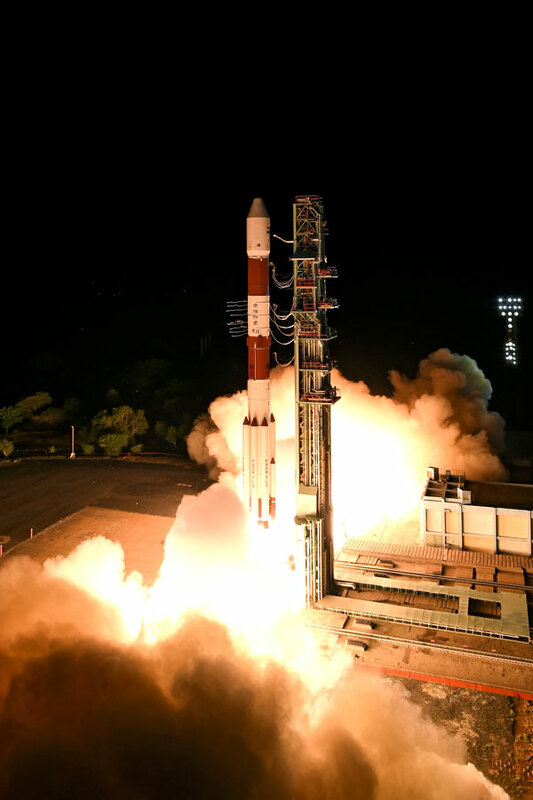 This was the twenty ninth consecutively successful flight of PSLV. PSLV was launched today in its heaviest ‘XL’ version with six strap-on motors of the first stage. This flight was unique since for the first time, the ‘XL’ version of PSLV was used to launch foreign payloads exclusively. Till now, the lighter ‘core alone’ version of PSLV has been used to launch foreign payloads exclusively. PSLV has successfully launched 45 satellites for customers from abroad including five UK satellites launched today. Through 29 successful flights during 1994-2015 period, PSLV has launched a total of 77 satellites with a total mass of 32.04 tons, of which 4.64 tons (about 14%) comprises 45 satellites for customers from abroad. The vehicle has repeatedly proved its reliability and versatility by successfully launching satellites into a variety of orbits including polar Sun Synchronous, Geosynchronous Transfer and Low Earth orbits thereby emerging as the workhorse launch vehicle of India. After a 62.5 hour smooth count down, the 320 ton PSLV-C28 lifted off from the First Launch Pad (FLP) at SDSC SHAR at 2158 hrs (9:58 pm) IST with the ignition of its first stage. The important flight events included the ignition and separation of strap-ons, separation of the first stage, ignition of the second stage, separation of the payload fairing at about 118 km altitude after the vehicle had cleared the dense atmosphere, second stage separation, third stage ignition and third stage separation, fourth stage ignition and fourth stage cut-off. Once in proper orbit, the three DMC3 satellites were successfully deployed about 18 minutes after lift-off in quick succession. Following this, the 7 kg Nanosatellite De-OrbitSail and the 91 kg Microsatellite CBNT-1 were also successfully deployed.